Besides diagnostic wax-ups and Radica temps, Thompson Suburban Dental also offers milled PMMA provisionals. PMMA (polymethylmethacrylate) is a synthetic resin characterized by strength, high density and excellent resistance to abrasion. 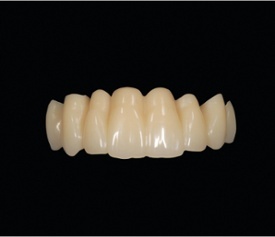 Designed and produced through CAD/CAM technology, modern PMMA provisionals are made with layered PMMA that allows for a more natural look, color variation and translucency. Milled PMMA is frequently used for temporary crowns and bridges in both long-term and short-term provisional applications. It can also be used for casting and overpress procedures, but typically a different type of PMMA not approved for oral use is designated for casting. Want to learn more about milled PMMA and how it can help your patients? Contact our dental lab today.